Devon County Council gives itself planning permission to build damaging incinerator. The Incinerator was given planning permission on Wednesday 18th July. Hardly surprising. It was Devon's policy in the first place. It was unlikely to refuse itself permission. But the fight goes on. It is our intention now to campaign for 30% waste reduction and 80% recycling. This will mean that the incinerator will be starved of waste to burn. If it does get built, it's viability will be questionable. We must persuade Devon County Council to change its mind. 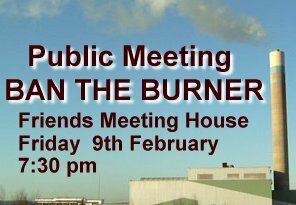 The environmental and health objections against an incinerator have been well rehearsed. 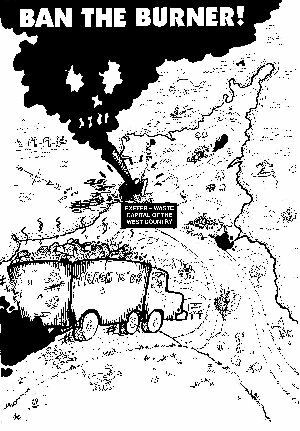 Unquestionably, an incinerator is a highly toxic, high carbon approach to deal with residual waste, and is proposed for an area already highly polluted and with an enormous carbon footprint. It is also such a scandalous waste! There will be no sorting of the waste arriving at the incinerator. It is clear that a large proportion of what is burned will be materials and resources that could be recycled or composted instead. This is one of the principal reasons why we have argued for the mechanical and biological treatment - or MBT - of residual waste. Anyway, I do not wish to recycle the environmental arguments, strong as they are. I want instead to focus on what I believe to be the greatest tragedy if planning permission is granted. That is the frightening lack of foresight of the potential changes to the globe, society and waste management likely in the next 30 years. One of the main rationales for the incinerator is the deeply flawed idea that residual waste in the region will rise rather than fall. Flawed because all the signs are that waste cannot and will not increase, and we will actually see drastic falls in the amount of waste we generate over the next 30 years. Why? In the next few years manufacturers and retailers will be tripping over each other to be seen as ‘going green’. Indeed this process has already begun with many cutting out their packaging altogether or redesigning it to be compostable. In the next 5 to 15 years - the inevitable move towards a ‘pay as you throw’ system for household waste, will mean that consumers will want to reap the financial rewards of reducing waste and increasing recycling and composting. At some stage in the next 30 years - the onset of peak oil - where global demand for oil massively outstrips supply - is likely to have the greatest impact of all. The resulting doubling, tripling or even quadrupling in the price of oil will have profound effects on the way we live and revolutionise the way we make, use and treat materials and resources. Also in the next 30 years, many of the predictions about the impacts of climate change will undoubtedly come about increasing pressure on governments to agree to far greater cuts in CO2 emissions. It is wholly inconsistent to have an incinerator belching out 45,000 tons of CO2 annually, when as a region we may have to reduce our carbon emissions in the order of 80%. If society is heading towards massive reductions in residual waste - and even zero waste as Exeter City Council has committed to - within the next 30 years - the incinerator will become a redundant white elephant. Except of course there will be the small matter of a 30 year contract to honour. Given the legal restriction on the catchment area we have to ask where will this waste come from? All this leads to the crucial question: what role an incinerator in tomorrow’s world? The draft Regional Spatial Strategy, to which Devon County Council has contributed, highlights that: "The South West’s ecological footprint is unsustainable as it stands. If everyone on the planet consumed such a quantity of natural resources and energy as an average South West resident, three planets would be needed to support life on Earth. Consequently, a shift is needed towards ‘one planet’, lower consumption, with lifestyles which are more resource efficient. This should include a move towards locally produced, replaceable natural resources, more efficient usage of energy, better waste re-use/recycling." I urge the councilors here today to reflect on that statement. I am sure you will then conclude that incineration is yesterday’s flawed solution to what could quite quickly become yesterday’s problem of waste. A NEW INCINERATOR FOR EXETER? In April 2007 Viridor (acting on behalf of Devon County Council) applied for planning permission from Devon County Council to build a new 60,000 tonne "energy-from-waste" incinerator in Marsh Barton, next to the Valley Park in Exeter. The incinerator will emit 45,000 tonnes of CO2 every year. (incinerators are just as bad as coal fired power stations). It will damage prospects for high levels of recycling. It will destroy valuable resources. For materials sustainability we should be keeping these resources in the system. It will produce toxic ash which is difficult to landfill. It will release dioxins and other pollutants into the environment. It will provide fewer jobs than recycling. Its size will result in lorry movements from other parts of Devon. The waste smoke stack will have damaging visual impact on valley park. It is too large requiring waste to be carted in from East Devon, Teignbridge and Mid Devon. It is too expensive: £32.5 million, and £6 million every year. - Minimise our Waste in the first place. - Build a Mechanical Biological Treatment plant to deal with the Residual Waste. Sign our Online Objection! - You can still object! 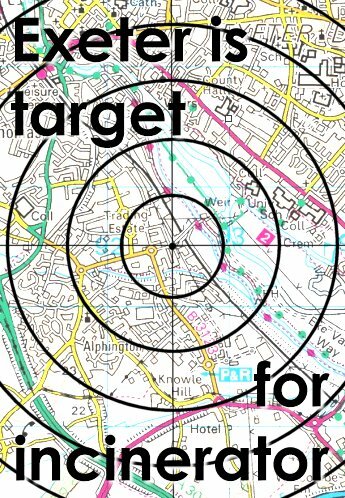 Exeter FoE's 11 page formal objection to the incinerator was submitted on the 18th June. The objection can be downloaded by right clicking here. Right click and select "Save Link As.. "
A 10 page report was sent to Exeter City Council on the 28th May 2007, stating that a new incinerator was clearing inconsistent with Exeter City Council's bid to become a "Zero Waste" authority. Please download the report by right clicking here. In December 2006, the Express and Echo ran an on-line vote on the Incinerator Proposal. 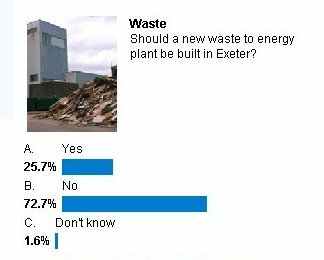 It is clear that the people of Exeter are not very happy about an incinerator, even if it "Energy from Waste". There are now 4,000 signatures on our "No Incinerator" petition. 1,400 Postcards and 90 Letters of objection have been sent to Devon County Council. MBT stands for Mechanical Biological Treatment. It describes a family of technologies that focus on mechanical and biological treatment of our residual waste. This type of plant first mechanically breaks down and screens the waste to allow more waste to be recycled. Then the biological waste is treated in an Anaerobic Digester or Aerobic Composter, which produces a range of outputs including Compost, Biogas or soil improvement material. The element that is finally landfilled is thus reduced to a minimum, but more importantly it will be stabilised, thus not producing any methane emissions. We have calculated that Exeter throws away about 20 Million unwanted plastic bags into landfill every year. This campaign aims to inspire Exeter citizens to "Say NO to Unwanted Bags". We have a petition with 2,400 signatures saying "We, the undersigned, support the SNUB campaign to persuade City Centre stores to stop the issue of free bags, unless specifically requested by customers. We pledge to say NO to unwanted bags if unnecessarily offered by stores". The alternative to the plastic bag is not the paper bag (Paper bags have less capacity for being reused and they require more energy and resources to manufacture and transport than plastic alternatives) but to carry a lifetime bag with you wherever you go. Usually this will be a strong cotton or jute shopping bag which is easily folded up and carried in your pocket. (Make sure it's organic cotton). Or you could carry a rucksack with you. The superstores also produce a Bag for Life which is another good alternative, but it would be better if it wasn't made of plastic. - And when you get offered a bag, say "No" politely, and get your "Bag for Life" out of your pocket. In addition we will be writing to every retailer in the centre of Exeter asking them to sign up to the SNUB campaign. We will be requesting that they adopt a policy where they don't automatically give customers a plastic bag, but only if it specifically requested.